Building on the concept of a virtuous circle, as presented at the 2006 Museums and the Web proceedings, the Natural History Museum has continued to explore ways in which it can extend its relationship with visitors, to gain greater insight into visitor interests and to enrich and personalise the visitor experience across both the virtual and physical spheres. With the opening of the new Darwin Centre at the Natural History Museum in September 2009, the Museum created NaturePlus, a personalised visitor experience that drew on its expertise in developing integrated virtual and physical offers, and that used the latest social media platforms for delivery. This paper will look at how this project was developed from initial evaluation to implementation - the objectives, benefits, lessons learned - and look at how the system is being used and what has been achieved in the five months since launch. The 21st century Museum is defined as much by its digital content and use of digital media to engage its visitors as by its physical collections and content. User-generated content, social networking and global access to our collections affect how we operate as a museum across all our functions, from research and curation to exhibitions, learning and commercial businesses. In the past the physical and virtual museum were often seen as two separate offers. Today it is more likely that they are seen as one rich offer with opportunities to distribute content over multiple channels and with the potential to fundamentally change the relationship with the visitor from passive to active. In order to maximise the potential of this offer, museums have to develop a holistic view of the audience journey across both the physical and virtual spheres. Digital media enable visitors to expand their experience beyond the walls of a museum and create a ‘virtuous circle’between the virtual and physical space. 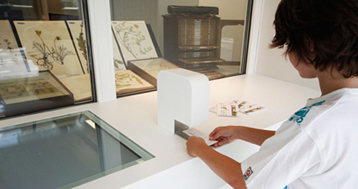 On-line visitors are inspired to visit the museum, while within the museum visitors can extend their journey by book-marking, voting and sending links of relevant information home via a variety of media outlets (interactive kiosks, mobiles, PDAs). The museum experience can therefore be explored by visitors in their own time and personalised to suit their interests. On-line visitors can engage with specialists, scientists, curators, and visitors with similar interests, exchanging information and participating in a variety of activities: joining groups, forums and communities. For museums such personalisation gives greater insight into visitors’ interests and enables the museum to build a more engaged community. Understanding visitors’ preferences and interests enables the museum to offer a range of targeted services and content and creates the opportunity to develop a ladder of engagement that can lead from participation and engaged learning to membership and donations. But it is not only visitors who can take advantage of social media and personalisation. Museum staff, including researchers and curators, benefit by being able to collaborate with colleagues across the globe, accessing the same information in real time - even in the most remote of locations. The opening of the new Darwin Centre in September 2009, highlighting Natural History Museum science and science processes, gave the Museum the opportunity to create an extensive personalised visitor experience that would be a cornerstone of the Museum’s future digital strategy. Building on its past experience of developing a ‘virtuous circle’ between its virtual and physical offers in temporary exhibitions through using barcoding and mobiles (Barry, 2006), the Museum has developed a personalised visitor experience called NaturePlus that spans both the Darwin Centre and its on-line site. Within the Darwin Centre, visitors can bookmark and collect information from eight interactive exhibits using a card with a unique barcode and ID number which they scan on exhibits that are of interest. Mindful of the requirement to make the bookmarking memorable and ensuring that visitors retained the cards, the Museum designed four sets of cards. Each card featured a specific exhibition object which visitors were encouraged to find. The intention was that, within a group, the cards visitors received would most likely be particular to them. On-line visitors register their unique IDs to access a personalised Web site where the information they have bookmarked is saved. Their personalised area also has their particular card specimen with additional information. Alongside their saved content, visitors also receive links to additional related content; e.g. articles, videos, forums and events from both the Museum and external providers. In this way the registered visitors are presented with a rich content offer tailored to their interests. The bookmarking therefore serves as an entry point to that variety of content. These links are updated dynamically so that topicality is maintained. Once registered with NaturePlus, visitors can join a range of Museum forums, add user-generated content, vote, and comment. This increased focus on participation enables visitors to engage with the Museum on a deeper level and encourages communities and dialogue. NaturePlus is not just confined to visitors to the Darwin Centre. All on-line visitors can register for NaturePlus, whether or not they have visited the Darwin Centre and received a unique card. Additionally, a single-sign-on mechanism links together all areas of the Museum Web site that require registration. 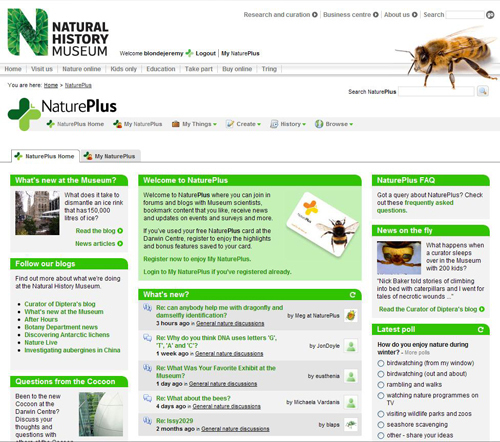 Therefore whether registering specifically for NaturePlus forums or for Membership or Donations, through a single registration process the on-line visitors automatically have access to NaturePlus features and their own personalised pages where they can bookmark areas of interest within the Museum site. In future, visitors will also be able to optionally register their preferences (due to come on stream in April 2010); e.g. interest in subject areas such as dinosaurs, or notification of activities such as events and talks. Once preferences are registered, visitors will be served content to support their interests through promotions, links and targeted e-news. Visitors’ profiles will be held in a centralised CRM which will enable a managed approach to customer relations across the Museum, mindful of the permissions that visitors have granted. As well as general visitors, specific groups expressed interest in using the personalisation and social media features of NaturePlus. The Learning department expressed interest in developing a password protected extranet to enable schools to form groups and allow collaboration and access to personalised Key Stage materials linked to the collections. NaturePlus therefore created a seamless user journey between the physical Museum and on-line – a journey which becomes a virtuous circle, extending the visitors’ relationship from the physical space to the virtual world and back again. NaturePlus was seen to be instrumental in delivering a number of benefits that support the Museum’s digital future. The implementation of a personalisation strategy aligned to our current CRM was key in creating a better understanding of our visitors, allowing the Museum to deliver relevant content to visitors at the appropriate stage in their on-line journey and enabling greater contributions from both the public and peers. It was also a strategic development in managing our communications, marketing and retail offer. The development of an underlying robust, collaborative and scalable technical infrastructure to support personalisation was seen as vital in supporting the Museum’s long-term digital delivery. A series of consultations with stakeholders from across Museum departments helped capture requirements and maximise the potential of the service. From these, additional benefits were identified around the implementation of personalisation and social media. Specifically, a password protected area across the site had specific value internally for Museum departments, including Marketing, Science and Development. Group functionality for sponsors and media partners to enable their audiences and staff to have access to premium content. Alignment with our CRM to deliver targeted offers to shoppers, members and those interested in Museum eNews, helping the Museum to learn more about its visitors’ preferences and interests. Through more targeted access to content, increasing repeat visitors to the site by 3-5 % above the current average of 26% for repeat visitors. Based on previous analysis of the Museum’s temporary exhibitions, the Museum was looking at having an average of 7.5% of Darwin Centre visitors register for NaturePlus. Pilot an extranet for schools to support the learning department. A number of formative evaluations were carried out prior to finalising and implementing the concept. The first formative evaluation carried out in October 2008 interviewed twenty adults in one-to-one and paired interviews. Additionally, school sessions at three different schools were undertaken. These consisted of group discussions split between students and teachers in key stages: KS3 and KS4/5. These sessions examined privacy concerns around e-mail and levels of interest in the broader concept of the personalisation offer. Very little resistance was encountered in any group to signing up with an e-mail address – the NHM was considered a trusted party, although a privacy statement when signing up would be welcomed. Adults were most interested in news information about areas of interests, updates on events of interest, field videos and articles by Museum scientists. Some suggested a recommendation system on the basis of their selections, similar to those on retail sites, to direct them to content or events they might be interested in. Although some respondents initially found it difficult to envisage how they might comment and share content with their friends, once presented with a list of possible collectables and on-line activities they became more enthusiastic about how they would use the space. For adults the ability to blog was of the least interest. Students were more interested in all types of content suggested. Younger students were interested in games and mp3 tours, while KS5 students felt that events and news stories would be useful as they are encouraged to broaden their interest beyond what they cover in classroom. The second evaluation in October 2008 used the same methodology and tested the specifics of the NaturePlus usability and the name. Once the concept was understood, there was a high level of interest. All respondents (adults, students and teachers) said they would pick up and use a NaturePlus card during their visit. School groups were particularly engaged; all students could see the value it would add to their school work, and were excited about a new way of looking at the exhibits. Even the more hesitant adults who demonstrated less understanding said they would pick up and try out the card. The name ‘Natureplus’ summarised for many what the concept was and suggested they were getting something ‘in addition’ to their visit. Some likened the name to services such as ‘Sky’ or ‘Freeview Plus’, where something additional to the standard service package was anticipated. Most respondents grasped relatively quickly the idea of Natureplus and how they might use the card. There was some indication that the ease with which they picked up the idea was dependent on age. Younger adults and students across all three key stages were generally quicker to pick up on the idea, even when they received limited instructions. From a series of different prototypes, there was a very clear preference for prototypes that allowed visitors to select a variety of items to bookmark and then save with a single card insertion [scan] to collect these items. Although the majority of respondents were able to quickly work out the concept, a number struggled to do so. It is was therefore recommended that a range of communication materials be developed to cover different learning styles (e.g. a video, a poster and clear instructions on both the terminals and the back of the cards); the importance of training front of house staff was clear. This was felt to be particularly important at the initial interactive display where visitors will be using their cards for the first time and are most likely to need help. find learning materials specific to schools. Students and teachers were very positive about the possibility of a personalised experience. Students liked the fact that the activity was open ended and gave them freedom to choose which things to collect. Some felt this would make them more motivated to carry out the activity as they would have a greater sense of ownership. They also felt they would be more likely to remember what they had discovered. One of the advantages of the NaturePlus approach identified by the students was that all the information they needed to complete future activities would be available in one place. Overall, there was less interest from respondents in collecting comments they had made within the exhibition. This reflected the fact that respondents were reluctant to offer their own views and opinions on issues raised within the exhibition. To implement NaturePlus, a technical infrastructure or ‘technical spine’ was required to support personalisation both for the Museum exhibits and on its social media Web site. This technical spine had to be flexible enough to provide a cornerstone for future development of personalised content within the Museum. One of the core services developed was the Single sign-on (SSO) system that allows users to log-on a single time to access content across the site without being prompted to log in again at different registration points. This also allows for the update of any internal site to authenticate against this new service and remove the need for multiple user-ids and passwords within the Natural History Museum site. This service is based on the CAS product (http://www.jasig.org/cas). associate visitor-selected materials with a barcode and present this on-line. The Web service library was developed internally using the Java platform and contains all the business logic required to manage the assets on an interactive (e.g. an image and associated links), the selecting and attaching of interactive assets to barcodes, the storing of custom assets such as the postcard, and the retrieval of assets attached against a barcode ID. The Darwin Centre gives visitors the option of bookmarking items of interest on interactives and uploading user generated content, such as photos of themselves, and exploring these in more detail on their personalised NaturePlus section of the Museum site. All these items are recoded against a barcode number on the cards that visitors are encouraged to pick up during their tour. In the case of bookmarking items of interest, once the item is selected and the barcode swiped under the interactive’s barcode reader, the interactive only has to talk to the Web service library and send it the id of the bookmark and the barcode number. The Web service will then interface with NHM systems to attach the bookmark to the barcode number. All items bookmarked against a barcode are then available to the visitors on their personal pages in NaturePlus once they have registered and entered their card numbers. The list of bookmarks on a home page is unique to each visitor and provides a starting point for exploration of the subjects selected during the tour. NaturePlus was developed using the collaboration and social networking software Jive SBS. This gave the museum an out-of-the-box feature-rich platform to build on and adapt, and its open API approach allowed it to interface with the Web service library to return visitor bookmarks and their supporting links and images. Its security model was also modified so that it authenticates against the SSO service making it fully interfaced to the technical spine and able to serve personalised content from existing and future personalisation services. The content developed around NaturePlus focused on the Museum’s overall brand shift to create greater awareness of the science of nature and the Museum’s research. As a result the initial focus in developing content or creating areas of interest has been centered on the topics covered in the Darwin Centre exhibits, including science blogs, identification forums, communities and topical polls. This content also is strategically linked to the Museum’s citizen science initiatives and its commitment to support the International Year of Biodiversity. Topicality is seen to be key in the success of NaturePlus, and the operational plan is to refresh links and content regularly. It was recognised that for NaturePlus to flourish commitment was required from across Museum departments, particularly Science, in creating interesting content and updates on a regular basis. NaturePlus is managed by IM editorial staff with experience in the management of communities. The site is managed daily during working hours and occasionally at weekends. Because of the newness of the service and the wide age range of constituents, the site launched with all postings being moderated and pre-read. All new posts are uploaded within 24 hours, 72 hours maximum at weekends. The intention is to change to post-moderation for most elements as the community develops. Feedback to queries about the service from the public is offered through an email forum which is managed by the Interactive Media team. Currently the NaturePlus area has seven blogs which include a number written by scientists outlining their work and projects, one relating to Nature Live events, and one which covers a general ‘what’s new’ at the Museum. These are updated between 1-2 times a week. There are various discussions, some of which have been initiated by Museum staff and others initiated by the public, including a popular thread on what people most enjoyed during their Darwin Centre visit. For teachers and students there is a specific area which is available to learning groups who have visited the Darwin Centre. We will be testing, with teacher panels, how this can be rolled out further to offer groups for shared learning. Additionally, the Museum launched a number of pilots for internal stakeholders, including groups to support science collaboration internally, nationally and internationally. From past Museum learning, the implementation of any new technology was dependent on front of house training and the marketing of the concept through videos, signage and external communication. Training sessions were organised with front of house staff, and digital signage developed. Additionally, instructions were clearly given on the NaturePlus cards and pick–up points through the exhibition. In addition, the initiative offered a number of marketing opportunities. The Museum had considerable press coverage of the opening and optimized the coverage of the card. There was also the opportunity to distribute 80,000 NaturePlus cards in a magazine, TimeOut, as well as to distribute 4,000 pre-loaded cards through the Museum’s in-house membership magazine in January 2010. The development of such a broad-reaching strategy required a cross-museum approach with an integrated team that included Interactive media, Interpretation, Marketing, Science, Special Effects and IT. Additionally, the integration of NaturePlus within the exhibits meant that the project was tied into external software design suppliers as well as external social media suppliers. One of the highest risks to the project was that the implementation of the NaturePlus interface on the exhibits and the content that was being bookmarked was necessarily quite far down-stream in the development of the overall exhibition offer. 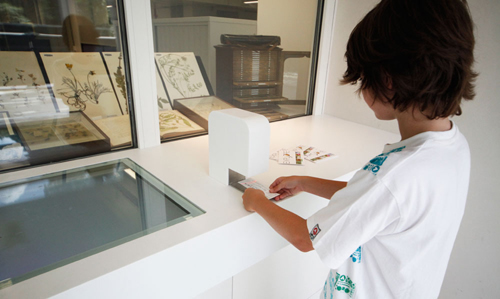 The NaturePlus content could not be finalised until exhibit content was completed, and the interface could not be tested in situ until the exhibition kiosks were installed. Although there was rapid proto-typing of the kiosk material with limited user evaluation, it became apparent that this really gave an inadequate view of how the experience was used in context, and the reality that visitors would rush towards the seductive flashing red lights of the barcode reader and scan their cards without selecting material or reading any instructions was not considered by the designers. Nor was the fact that the cards proved to be so popular that visitors were collecting the set of four designs from dispensers and that within three months the yearly allowance was in danger of rapidly being used up. With a project of such magnitude, almost inevitably there was slippage. As a result, the complete experience could not be tested until just before launch. Valuable lessons in understanding how visitors would react and use the exhibits therefore could only be captured and remedied after launch. Although stakeholders had been consulted extensively, the newness of the concept meant that for many individuals it was difficult to understand and there was a reluctance to contribute content and ideas, and the launch offer partially reflected this. NaturePlus definitely offers a new way of engaging with our visitors and peers - encouraging an ongoing relationship, dialogue, and the opportunity for participation. It has the potential to enable the Museum to broaden and deepen its interactions with its audiences through the provision of highly relevant personalised experiences that continue post visit. To date there has been mixed success in achieving this. Although the Museum had projected that 7.5% of visitors to the Darwin Centre Cocoon would register for NaturePlus, there has been a registration of 7000 in the first four months of opening, or 4.5%. However, take-up of scanning and bookmarking is high, with 65% of visitors bar-coding content. There are a number of factors that may be contributing to this. Aside from the initial marketing, there has been little internal or external marketing of the concept or of the communication of a personalised NaturePlus on-line area. The drop off from an initially higher uptake suggests that this could be a contributing factor. Additionally, in order to allay concerns around the security requirements of single sign-on, the registration process is fairly robust and requires e-mail notification and an alpha numeric password. This may deter visitors from joining even though they have scanned their cards. Currently there are also few incentives, aside from viewing saved content, to join NaturePlus. This is reflected in that fact that 78% of NaturePlus visitors have been to the Darwin Centre and have saved content to view in their personalised areas, and only 22% have joined from the site without visiting the Darwin Centre. However, in terms of retention, NaturePlus has been extremely successful; 53% of visitors are return visitors as compared to 30% across the rest of the site, and 20% of visitors return over 6 times. This indicates a deep engagement of visitors and keen interest in the content. When preferences come on stream in early 2010 and are fully tied into the CRM system, we hope to see an increase in acquisition and retention. One of the key benefits of NaturePlus is to enable the Museum to support secondary science. To date 296 schools have registered a bar code, although personalised learning materials are currently limited. Expectations are that when pre and post-visit material comes on stream there will be an increase in uptake. As it is an experimental programme under development, the Museum recognises the need to be nimble in responding to opportunities and to constantly monitor usage in order to build on success and to change areas that are not delivering. We therefore expect the roll-out to be fairly fluid for the first 9 months as we beta test with groups across the Museum and deliver new areas of content. To develop the user base we will be promoting NaturePlus through social media channels such as Facebook and Twitter and will develop content plans to drive acquisition and activation, increase engagement, and develop retention. The Museum is currently looking at a wider rollout of NaturePlus within its permanent and temporary exhibition development. It is also interested in pursuing how NaturePlus also offers greater collaboration with colleagues both inside and outside of the Museum. For the future, it is foreseen that NaturePlus will serve as a lynchpin in our relationship with visitors, allowing us to understand and meet their needs and enabling the visitors to drive its development.